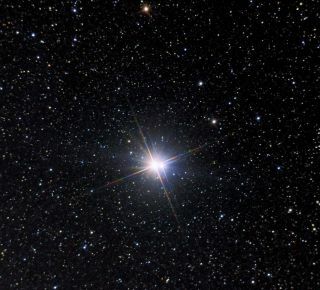 The vivid double star Albireo shines in blue and orange in the cold autumn sky. Despite the abundance of faint stars and rather dim constellations, the beautiful Milky Way and several attractive star clusters make for lovely sights on a midautumn night. And with a bright moon out of the way, this is the week to go exploring with binoculars or a small telescope. Crisp, cold fall evenings, like the ones the northeast and midwestern United States experienced last weekend, provide good opportunities to explore the celestial sights of midautumn. These include the Milky Way galaxy, which spans the sky from west to east this week at around 8:30 p.m. local time, passing directly overhead. The moon is currently confined to the predawn morning hours and is a diminishing ("waning") crescent, which should allow viewers far from city lights to get a good glimpse of this broad, almost tattered band of faint light. While primarily a summertime star pattern, Cygnus, also known as the Northern Cross, can now be found nearly overhead soon after darkness falls and is still halfway up in the western sky by around 9 p.m. Within its boundaries is one of the most beautiful double stars, Albireo, located in the swan's beak, or foot of the cross. A good pair of 7-power binoculars should easily resolve it into two stars that exhibit a beautiful color contrast of diamond-blue and orange. That binocular view is proof for those who doubt that stars show color; so many people insist they are white and nothing else. Certainly, star colors are not easy to see, chiefly because our eyes' color sensors — the cones of the retina — are quite insensitive to dim light. At night, the rods take over, but they are effectively color-blind. Only the brightest stars can excite the cones, unless you use binoculars or a telescope to intensify a star's light. Color perception is aided further by the close juxtaposition of a contrasting pair of stars, as in Albireo. The November Milky Way is notable for the many open star clusters in and near it that invite inspection in binoculars. This week, you should be able to find a hazy patch of light in the Milky Way, high in the northeast between Cassiopeia and Perseus. There are actually two concentrations here, called h Persei and Chi Persei, more popularly known as the Double Cluster in Perseus. The ancient astronomers Hipparchus and Ptolemy mentioned it as far back as 150 B.C., referring to it as a cloudy spot. With his crude telescope, Galileo first noted they were really clusters of stars. They contain very massive blue stars and some of the brightest red stars known. The blue stars are extremely hot, on the order of 100,000 degrees Fahrenheit (55,500 degrees Celsius), blazing out energy so fast that they cannot keep it up for more than 10 million years, changing to red as they age. H Persei is 6,800 light-years away, with Chi 800 light-years beyond. Together, they appear larger than the apparent width of the full moon and are exquisite sights in binoculars or a low-power telescope. About halfway up in the northeast sky in the mid-evening hours, the constellation Auriga can be found. Its highlights include yellowish Capella, the second-brightest star currently above the horizon, and a row of three clusters of stars that are readily visible with only the slightest optical aid. Messier 36, Messier 37, and Messier 38 look quite similar to each other in binoculars — hazy gray glows lurking in a field rich with tiny stars. A more careful look reveals differences among them. Messier 36, in the middle of the row, is smaller and more concentrated than the other two. Messier 37 and Messier 38 are about equal in size, but Messier 37 is brighter. All three clusters are roughly the same distance from the sun, in the range of 4,000 to 4,500 light-years. Their estimated ages, however, differ widely: 25 million years for Messier 36, 220 million for Messier 38 and 300 million for Messier 37. Another binocular highlight nearby is a pattern known to some as the Leaping Minnow, a little group of 5th- and 6th-magnitude stars. The last two open clusters on our tour are both in Taurus, to the north of the Milky Way. The first is the Hyades, marking the famous V shape of the bull's face. A cluster of this type is called an open cluster, because it has no obvious organization or symmetry. The stars move together through space like a family on a hike, seemingly going both across the sky and away. The paths of the stars converge on a "vanishing point" far to the east, near the bright star Procyon in Canis Minor (the little dog). The resulting geometry allows us to determine the cluster's distance with some accuracy — 151 light-years, which means that its age is about 625 million years. Higher in the sky, the Pleiades, popularly called the Seven Sisters, resemble a little dipper. About 400 light-years away and some 20 light-years across, the group may be no older than 20 million years and contains hundreds of stars. Several stars in the cluster seem to be enveloped in clouds of dust, perhaps left over from the stuff from which they formed. Depending on sky conditions and light pollution, most people can see between four and six naked-eye Pleiads. Some people with more acute vision can count many more. One such person is Allen Seltzer, who claims to have seen as many as 19 Pleiads with his unaided eyes while observing under pristinely dark skies from rural Arizona. Seltzer, who, four decades ago, served as education director at New York's Hayden Planetarium, is blessed with unusually keen vision, which he once demonstrated to me by reading The New York Times from across a nearly 20-foot room! Binoculars are easy to handle and relatively inexpensive, and they are helpful for learning the constellations and getting acquainted with many attractive deep-sky objects. And when held steadily, they also give you a glimpse of the craters of the moon, the crescent of Venus and the moons of Jupiter. Plus, because they don't give an inverted (upside-down) view, binoculars are convenient for comparing a sky map with the stars themselves. The practical experience they give will enable beginners to get more satisfaction from their first telescope. Of course, you'll want to consider all these things as we approach the holiday gift-giving season.